'''Mirza Ahmad Sohrab''' ([] - []) was a [[Persian people|Persian]]-[[United States|American]] author and [[Baha'í Faith|Baha'í]] who co-founded the New History Society and the [[Caravan of East and West]] in [[New York]], and was [[Excommunication|excommunicated]] from the Baha'i apparatus in [] by [[Shoghi Effendi]]. '''Mirza Ahmad Sohrab''' (1893 - 1958) was a Persian-[[United States|American]] author and [[Baha'í Faith|Baha'í]] who co-founded the New History Society and the [[Caravan of East and West]] in [[New York]], and was [[Excommunication|excommunicated]] from the Baha'i apparatus in 1939 by [[Shoghi Effendi]]. This page writen and copyright 2007-2008 by Will Johnson, [mailto:wjhonson@aol.com wjhonson@aol.com], Professional Genealogist. This page is locked, if you'd like to comment on it you may email me. It was while accompanying Abdul Baha in 1912, that Ahmad briefly met and began wooing Juanita Marie Storch, when she was brought by her father to meetings with Abdul Baha in Oakland and San Francisco in 1912. Juanita was the daughter of Hugo William Storch (1873-1917), an architect, and his wife Johanna Thee. Hugo had been born in Mexico of Bohemian immigrants, while Johanna was born in Germany. The family at that time was living in Oakland, Alameda County, California. Since Sohrab returned to Palestine, the wooing took place long-distance by means of "five hundred letters". The coming of World War I, put a temporary halt to the letters as they were apparently being confiscated or at least not allowed through the lines, but at the end of the war, the lovers re-made their acquaintance (see [http://content.ancestry.com/iexec/?htx=view&dbid=8049&iid=NEWS-CA-OA_TR.1919_12_26_0018&rc=2758,1021,2891,1054;2910,1021,3043,1054;2942,1413,3071,1446;3412,800,3528,833;3671,1054,3810,1087;3416,1579,3530,1612&fn=&ln=Record+Juanita+Storch&st=d&ssrc=&pid=482240530 Oakland Tribune, 26 Dec 1919]). It was while accompanying Abdul Baha in 1912, that Ahmad briefly met and began wooing Juanita Marie Storch, when she was brought by her father to meetings with Abdul Baha in Oakland and San Francisco in 1912. (A more full biography of Juanita is [http://knol.google.com/k/will-johnson/-/4hmquk6fx4gu/11#view "Juanita Maria Storch", by Will Johnson.]) Juanita was the daughter of Hugo William Storch (1873-1917), an architect, and his wife Johanna Thee. Hugo had been born in Mexico of Bohemian immigrants, while Johanna was born in Germany. The family at that time was living in Oakland, Alameda County, California. Since Sohrab returned to Palestine, the wooing took place long-distance by means of "five hundred letters". The coming of World War I, put a temporary halt to the letters as they were apparently being confiscated or at least not allowed through the lines, but at the end of the war, the lovers re-made their acquaintance (see [http://content.ancestry.com/iexec/?htx=view&dbid=8049&iid=NEWS-CA-OA_TR.1919_12_26_0018&rc=2758,1021,2891,1054;2910,1021,3043,1054;2942,1413,3071,1446;3412,800,3528,833;3671,1054,3810,1087;3416,1579,3530,1612&fn=&ln=Record+Juanita+Storch&st=d&ssrc=&pid=482240530 Oakland Tribune, 26 Dec 1919]). In the meantime, Juanita had moved to Santa Rosa, California. They were married in New York on 28 Apr 1920 (''[[The Oakland Tribune]]'', 27 Jun 1920, ''The New York Times'', 29 Apr 1920 [http://content.ancestry.com/iexec/?htx=View&r=an&dbid=50000&iid=98587369&fn=&ln=Record+Juanita+Storch&st=d&ssrc=&pid=96112 here]). In the meantime, Juanita had moved to Santa Rosa, California. Both Juanita and Sohrab journeyed to New York City for the 12th Annual Bahai Convention (see [http://books.google.com/books?id=2A8YAAAAYAAJ&pg=PA208&dq=star+of+the+west+Vol+11+1920#PPA13,M1]). They were married there on 28 Apr 1920 (''[[The Oakland Tribune]]'', 27 Jun 1920, ''The New York Times'', 29 Apr 1920 [http://content.ancestry.com/iexec/?htx=View&r=an&dbid=50000&iid=98587369&fn=&ln=Record+Juanita+Storch&st=d&ssrc=&pid=96112 here]). The story of their long and long-distance courtship, intercepted mail, and his many love letters which never made it to her, captivated a number of newspaper who made comment upon it. For example the ''Sandusky Star Journal'' (Sandusky, Ohio) on 29 Apr 1920 said : "New York - East met west here today with the marriage of Ahmad Schrab, former secretary to the Persian legation and Juanita Storch, Santa Rosa, Cal. Schrab could have a harem in his own town but preferred one American girl." In the 1930 census Juanita Sohrab and her daughter Laila are living with her mother Johanna Storch in Santa Rosa, Sonoma County, California. Juanita and Laila lived for some years in Santa Rosa, with Laila showing up in Passenger Lists giving her address as Santa Rosa, at late as 1953. Juanita Storch wrote an article in the ''Oakland Tribune'', 5 Aug 1945 discussing her father Hugh W Storch's work on the "Diamond Adobe"
Although Sohrab wrote an Autobiography which covers his life up to when he joined up with [[Julia Lynch Olin|Mrs Julia Chanler]], he does not appear to mention his wife nor daughter, which is perhaps a bit odd. ''Portsmouth Herald'', 23 Jul 1921 : "Green Acre Conferences, Lectures by Mirza Ahmad Sohrab of Persia and Mr W.H. Randall of Boston; 'The Evolving Consciousness of Humanity'"
''Portsmouth Herald'', 21 Jul 1923 : "At Green Acre" "...'Confucianism', Mirza Ahmad Sohrab of Angeles [sic]"
''The Oxnard Daily Courier'', 2 Oct 1924 reports : "Ahmad is at present doing research work for several of the large Hollywood movie studios and is advisor for costuming pictures such as 'Thief of Bagdad'." Meanwhile, Ahmad moved to [[Los Angeles]], where he helped write a scenario for a movie dealing with [[Mary Magdalene]], for the actress [[Valeska Surratt]], who was herself a Baha'í. Valeska sued [[Cecil B. Demille]] and others in federal court in 1928 for plagiarism, and mentioned that Sohrab had helped her write the play. (''[[New York Times]]'', [[Feb 28]], 1928, p2) She states that in 1924 "she conceived a motion picture embodying the story, and engaged Sohrab as collaborator. Their manuscript, she says, in December, 1924 was turned over through Hays to De Mille who said he desired to show it to Miss MacPherson...De Mille, Surratt said, returned the manuscript in April, 1925, saying he could not use it.... In May 1927, the film was released, Miss Surratt continued, and it contained the 'plan, scope, scenes, and characters' of the story she wrote with Sohrab"
He found it necessary to go to New York to discuss business matters with Miss Surratt and it was through her that he was introduced to [[Lewis Stuyvesant Chanler]] and his wife [[Julia Lynch Olin|Julie]]. Together they formed the "New History Society" in 1929 as a way of spreading the teachings of the Baha'í Faith. 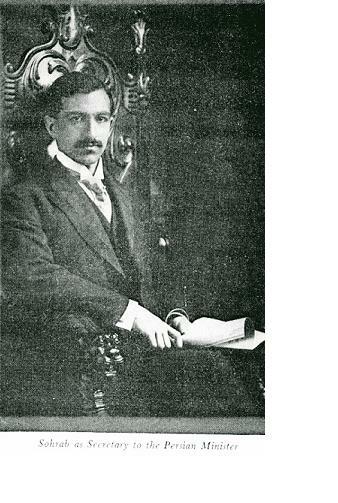 Julie attempted to patch things up between Sohrab and [http://en.wikipedia.org/wiki/Horace_Holley&28(1880-1960) Horace Holley], "one of the chief men in the American Baha'í Administration". ([http://freebahais.com/white.htm Free Bahais "White"]) But Sohrab refused to allow the New York [[Spiritual Assembly]], to have oversight of the affairs of the New History Society. Since Holley sat on the National Spiritual Assembly at this time, this led to a confrontation which resulted in Sohrab and the Chanlers being expelled from the Baha'i community about []. *[http://content.ancestry.com/iexec/?htx=View&r=an&dbid=50000&iid=519300522&fn=&ln=Record+Ahmad+Sohrab&st=d&ssrc=&pid=1369349 His obituary] published in Chicago in 1958 and extracted [[AhmadSobrab1|here]]. *[http://search.ancestry.com/cgi-bin/sse.dll?indiv=1&db=ssdi%2c&rank=0&gsfn=juanita&gsln=storch&sx=&gs1co=1%2cAll+Countries&gs1pl=1%2c+&year=&yearend=&sbo=0&sbor=&ufr=0&wp=4%3b_80000002%3b_80000003&srchb=r&prox=1&ti=0&ti.si=0&gss=angs-d&o_iid=21416&o_lid=21416&pcat=34&fh=2&recid=69770132&recoff=1+2 Social Security Death Index] showing : IS this Juanita ? "Juanita Storch, born 23 May 1895, died Jan 1987, last resided in Seattle, King County, Washington. SSN Issued by California in 1958"
*[http://search.ancestry.com/cgi-bin/sse.dll?db=ssdi,&gsfn=juanita&gsln=storch&sx=&gs1co=1,All%20Countries&gs1pl=1,%20&year=&yearend=&sbo=0&sbor=&ufr=0&wp=4;_80000002;_80000003&srchb=r&prox=1&ti=0&ti.si=0&gss=angs-i&o_iid=21416&o_lid=21416&fh=0&fsk=&bsk=&rank=0&pgoff= Social Security Death Index] showing : IS this Juanita ? "Juanita Storch, born 23 May 1895, died Jan 1987, last resided in Seattle, King County, Washington. SSN Issued by California in 1958"
*[http://search.ancestry.com/cgi-bin/sse.dll?indiv=1&db=CAdeath1940%2c&rank=0&gsfn=juanita&gsln=storch&sx=&gs1co=1%2cAll+Countries&gs1pl=1%2c+&year=&yearend=&sbo=0&sbor=&ufr=0&wp=4%3b_80000002%3b_80000003&srchb=r&prox=1&ti=0&ti.si=0&gss=angs-d&o_iid=21416&o_lid=21416&pcat=34&fh=0&recid=7102945&recoff=1+2 California Death Index 1940-97] showing: "Juanita Storch, born 23 May 1895 California, died 26 Jan 1987 Sonoma County. Mother's maiden name Thee"
*[http://search.ancestry.com/cgi-bin/sse.dll?indiv=1&db=2000WP%2c&rank=0&gsfn=laila&gsln=storch&sx=&gs1co=1%2cAll+Countries&gs1pl=1%2c+&year=&yearend=&sbo=0&sbor=&ufr=0&wp=4%3b_80000002%3b_80000003&srchb=r&prox=1&ti=0&ti.si=0&gss=angs-d&o_iid=21416&o_lid=21416&pcat=37&fh=0&recid=270332203&recoff=1+2 US Phone and Address Directories, 1993-2002] showing : "Laila Storch, 4955 Stanford Ave NE, Seattle, King County, Washington, residence from at least 1998 to at least 2002"
*[http://search.ancestry.com/cgi-bin/sse.dll?db=2000WP,&gsfn=laila&gsln=storch&sx=&gs1co=1,All%20Countries&gs1pl=1,%20&year=&yearend=&sbo=0&sbor=&ufr=0&wp=4;_80000002;_80000003&srchb=r&prox=1&ti=0&ti.si=0&gss=angs-i&o_iid=21416&o_lid=21416&fh=0&fsk=&bsk=&rank=0&pgoff= US Phone and Address Directories, 1993-2002] showing : "Laila Storch, 4955 Stanford Ave NE, Seattle, King County, Washington, residence from at least 1998 to at least 2002"
This page has been accessed 349,892 times.